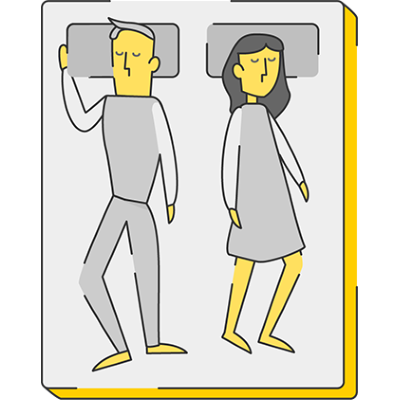 how do you and your partner sleep? Stomach sleepers benefit from a slightly firmer mattress, as it helps with spine alignment. Our original one is medium-firm - great if either of you crash out on your front. In this position, the shoulder supports a lot of the body’s weight. The original mattress keeps you supported, but is gentle under your pressure points thanks to a new type of premium foam and some tiny cut outs we’ve made in the base layer. Sleeping on your back is ideal for resting your spine in its most natural position. The type of foam we use is springier, which stops you sinking in, and keeps everything aligned. The eve original is wonderful. It really is. Sleep on it and you’ll get the best night’s sleep you’ve ever had. It gives you the type of out-of-this-world comfort that puts a skip in yours and your partners step the next day. Share a bed with a restless partner? Not a problem. We use a unique foam in our original mattress to isolate the movement caused by tossing and turning. Motion transfer can impact your sleep quality. Thankfully, the original mattress makes the aftermath of wriggling a thing of the past - so you both can sleep soundly. Sadly, we can’t do much about snoring. 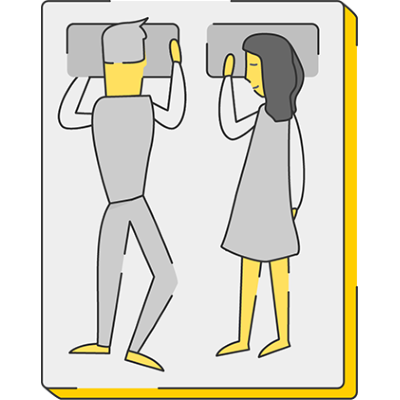 If you’re cool as a cucumber in bed, but your other half gets hot and sweaty, the original mattress could be a sensible choice as a couple. Traditional memory foams can leave things feeling a little hot in bed - and not for the right reasons. The clever foam structure of the original mattress helps to keep things cooler under the covers. It’s got ‘open-cell technology’ - a fancy way of getting more air through the mattress to stop the uncomfortable warmth. In fact, our evecomfort® foam layer is 30 times more breathable than conventional memory foam. One of the layers is also made from a pressure-relieving foam. This provides you and your partner with support right where you need it most. And, because the foam has a cloud-like bounciness, you won’t get that dreaded sinking feeling associated with the traditional stuff.